Check out my new Bass!!! - with a video! Discussion in 'Bass Area; The Bottom Line' started by SGNick, Aug 9, 2008. I got it last thursday, and just yesterday got it strung up with LaBella flats! 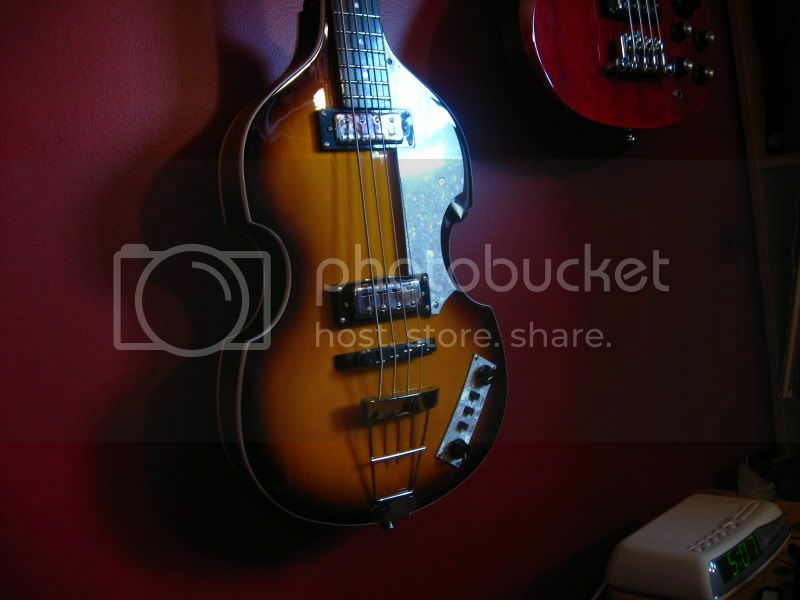 Meet my new Hofner Icon! I love the look, pretty sweet looking instrument! With the flats on there.... I love it! What's the optimal position for the knobs for that beatles tone? I love both switches off, with bridge pup off. Sounds really cool! Check out this video, I go through all the little tones. I made it because I noticed there were no Hofner demos online really! Icons especially! No Hofner fans? or no cheapy fans? Nice video brother! I love the Hofner/hollowbody decay with the flats you have going on in that mpeg...what amp were you running that thru? I'm assuming you captured the audio via your camera - but that's a really cool tone there! I actually pulled a lazy trick and plugged into my Zoom H4 on the bassman model! A time saver! Home... after 6 years on the road. something must be wrong on my end, I couldn't hear it. bummer, looks awesome. I had to turn it WAY up. Next time I record a tune with the bass, I'll send you a PM, You'll hear it in a band situation! Yeah, I tihnk it was a bit soft on the recording. That would be great! This is one of the basses I am looking at for my "Next Bass"
No problem no problem! I actually have a skeleton for a tune I'm working on. It's a short clip, it was my attempt at writing a Led Zeppelin sounding tune, but I don't have vocals for it yet. Either way, it's got the Hofner in the bass, not terribly loud in the clip, but you can hear it thump thump thumping away in the back. I'll send you guys the PM, I don't want it out yet, as it's not done technically! Thanks Nick - I appreciate it!!!! I'm really loving this bass by the way! Swap the strings for flats and it's a joy to play!!! 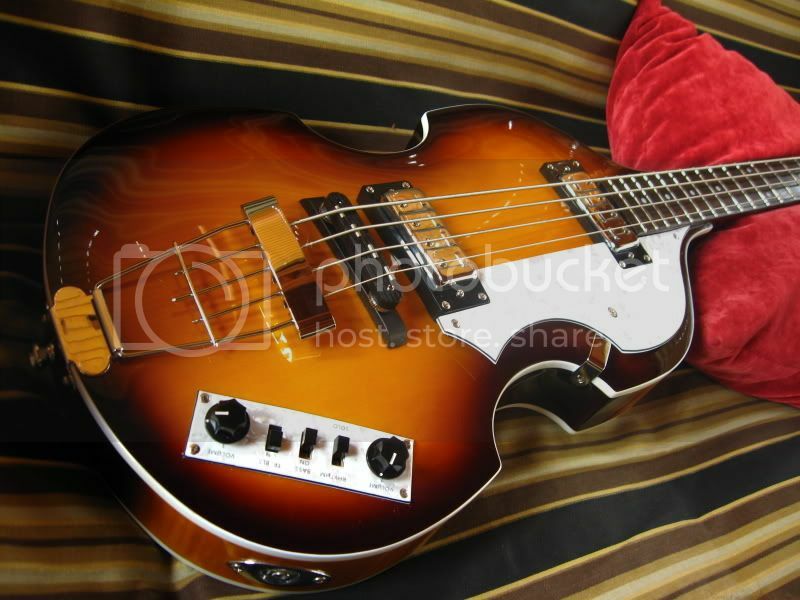 Thats a sweet lookin/soundin bass geetar you got there sonny! I seem to remember (the first time these became popular) that there was a problem with the necks. For example, they pretzeled. Not so anymore? Not sure, I haven't had any issues at all with the neck, it's straight and flat! Sorry, not trying to imply anything about yours - I was refering to the first time they became popular (in the late 60's). Then too, that's how old the memory is. If I can find the picture, theres on in particular where you can REALLY see how high the action is on Paul McCartney's first Hofner bass is! It's like mile high! I have to go to work now though, I'll try to find it though.